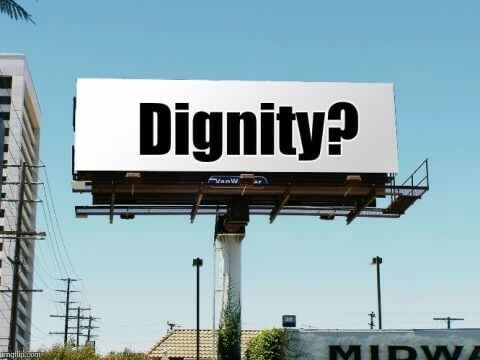 One only needs to drive around big cities like Manila and see billboards of half-dressed men and women to get an idea on how secular society views the human person. You go home, turn on your TV, and you’re greeted by the same degenerate garbage shrugged off by many as “artistic expressions” of the “facts of life”. Like, for example, that junk on the glorification of abuse and Stockholm syndrome being fed to our youth like candy coated apples and no one seems to bat an eye. Consent, my arse! If the dude was a trailer park junkie all you “feminists” would be screaming “patriarchy” and go on a social media crusade demanding a swift and cruel chastisement. All I can say is, for a society that claims to be progressive, we have regressed into thinking and behaving like unreasonable animals. Our culture has become increasingly consumerist. Majority of us treat everything as something to be bought and, once the object has served its relative purpose, it’s thrown away in order to purchase another. The sad thing is, it’s not only material goods which are sold — human beings have been reduced to mere commodities. You read about equality and dignity on the same magazines that sell human beings by their body parts. Just open up a Cosmo and see what I mean. Why is this happening? How did humanity become so depraved? Secularism which does not acknowledge God only follows the rule of Relativism. A relativist society cries for dignity but the purely materialist ideology which it chose for a god does not recognize it. It yells the word but in its confusion, it doesn’t understand what such a word means. In reality, they believe nothing has purpose, nothing has worth. Existentialism preaches that everything, including human beings, are no less valuable than a rock. Secularists speak of value as personally defined, “Everyone is free to do what he wants, an individual creates his own value”. Yet with this logic, there is no such thing as true equality of persons nor inherent fundamental “rights” as each considers himself entitled to his own versions of it. In a godless society, nobody has “value” except whom the individual, or his extension, the collective, gives it to and he believes his own authority to be the sole absolute. Only they have the freedom of will to choose and the rest must obey. This makes the person a dictator and all his perceived subjects must submit themselves according to the value he has set upon them depending on their usefulness to his own ends. The neighbor is nothing to these individuals but tools for their own use. They make themselves their own masters and, as a result, create insatiable monsters with many heads called vices, and then blame the consequences on a visible or invisible enemy, but never on themselves. It’s not surprising then, that the City of Man is in a constant state of unrest wherein many self-proclaimed Princes stage uprisings to assert themselves and their licentiousness under the banner, “for liberty and equality” whilst fighting everything they perceive as a hindrance to their selfishness, with which they measure their happiness. All of this, of course, is in stark contrast with the Christian Ideal. While the City of Man is founded upon the dictatorship of relativistic utilitarianism, the City of God is founded upon the freedom of Love. In this City, no one can assert dominance over the other as all only have One Master. One cannot assert himself as more valuable than another as all are equally servants of One. And because the many only love One, they only desire One Happiness and His happiness are made their own. we put all our trust in you, Lord. is your name and your memory. my desire for you leaves me breathless. Love allows one to freely choose slavery for his beloved, and to make himself last by serving his loved one first (Matthew 20:27–28). Humility, not pride, takes precedence over his actions. His love, then, is neither jealous nor in want (1 Corinthians 13:4–8). Because he loves his Master through his equal, he only desires that which is objectively good as God is All Good. Hence, the neighbor is not a tool or a means to an end but is an end in himself. He is seen in his metaphysical state, as a bearer of the Imago Dei. His being, visible (body) and invisible (person), is, therefore, given sacred value.